Beginner’s Guide To Airsoft #Infographic ~ Visualistan '+g+"
This guide takes a look at Airsoft, a gun combat game which is superseding Paintball. Played in a similar way to Paintball Airsoft takes outdoor team games to the next level. Created in Japan, Airsoft uses small plastic ball bearings, referred to as BB's, rather than paint balls to search and destroy the opposing team. Take a look at the guide to find out what protective equipments you'll be given to wear, the guns you'll be using and some basic Airsoft rules and tactics before you begin your team battle. 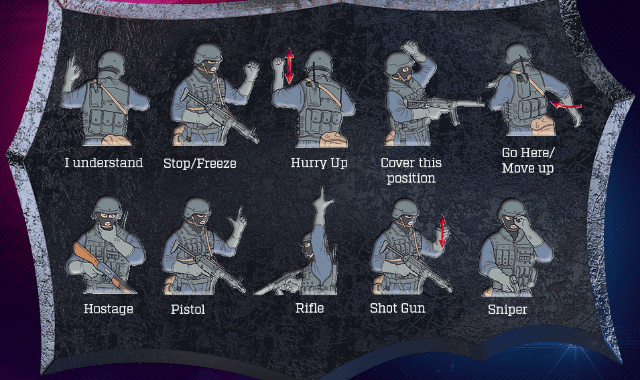 We've also included some very useful hand signals to use during the game to give your team the edge over your enemy and some ambush advice for capturing multiple opponents. You'll find Airsoft games fall into categories, including Team Deathmatch, Capture the Flag, Manhunt and Free for All, to name but a few, so there's a game to suit everyone. To play Airsoft you need to be brave and work as a team. It's ideal for team building events or a great way to spend some tough times with your mates. You won't know just how good your opponents will be on the day, so read the guide below to gain advantages before battle commences and leave the playing field victorious.